Fees for multiple withdrawals per month. Withdrawal commissions depend on the account type. Yes. You must make the minimum deposit to use the demo account. As of December 14, 2017, 24option is no longer offering binary options, operating solely as a Forex/CFD broker. The review presented below is no longer applicable and is presented for archive purpose only. 24option is one of the best known binary options and CFD brokers on the web; you will often find them highly recommended on third-party websites. We decided to have a look at 24option’s services and see for ourselves what they have to offer. 24option is regulated by the Cyprus Securities and Exchange Commission via its owner company, Rodeler Limited, which is based in Cyprus. 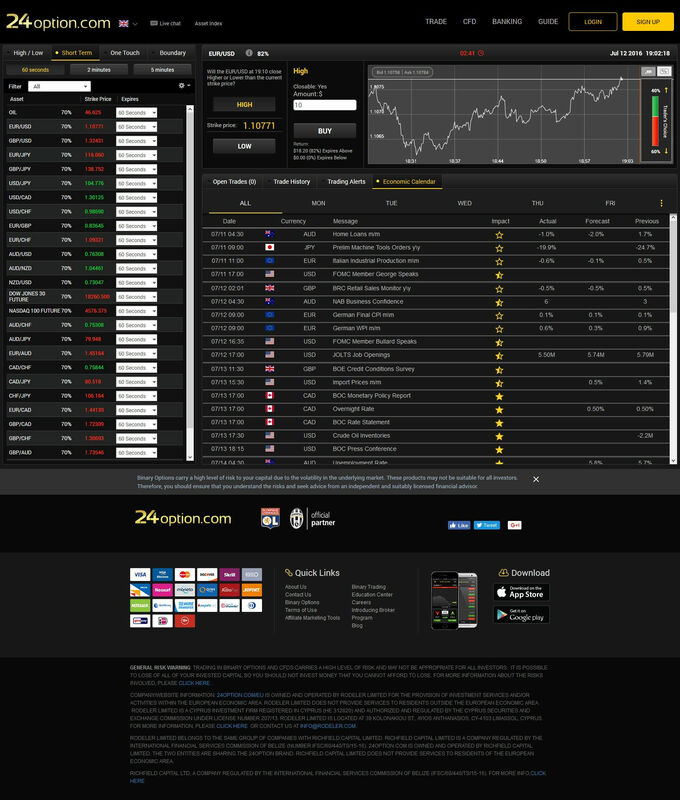 24option does not accept USA traders and offers its website in more than a dozen languages. The company provides a lot of great educational resources as well as a demo account, mobile trading, and some other exciting features. We definitely can understand where the positive press is coming from. You do not need to deposit to join 24option, but you do need to deposit to trade for real or using the demo account which is offered to new traders. The demo account is not advertised on the website (which is odd, considering what a great offer it is), but if you speak to a customer service representative, you can request one and discuss the terms for the account. Then you can try some free trades and get to know the platform before you trade with your real money. This is also helpful for testing out your trading strategies before they cost you. Sometimes something which works well in backtesting does not translate easily into real-time trading, and demo testing is the best way to find out. You can choose to trade using Euros, US dollars, British pounds, Japanese yen, Swiss franc, Chinese yuan, or Russian ruble. The minimum deposit is $250 or equivalent, and you can use a number of methods for deposit, including credit cards, wire transfer, or a range of online payment systems available depending on your country of residence. There are no fees for deposits, but there is a fee if you withdraw more than once per month, which depends on your account type. The minimum withdrawal amount is $10, which is pretty flexible compared to many other brokers we have researched. Match bonuses are also available when you deposit; they typically range from 30-100%, though on some days you may find special deals. These bonuses take the form of leverage; you need to turn over the bonus amount 50 times before you can claim the bonus as cash. Payouts on trades can range up to 88%, and there is no out-of-money reward (loss insurance). The platform is TechFinancials, which is used by a number of other binary options brokers, so it may be familiar to you from other trading experience. 24option offers mobile trading, which is an excellent feature that not a whole lot of other binary options brokers offer at this point. That means you can trade anywhere, anytime you are connected to the internet. The mobile interface looks very polished, just like the main website interface. One thing we really like about 24option is that you can trade as little as $24 or as much as $200,000. The minimum amount could be a little lower, but it is not that high, and the maximum trade amount is much higher than most! That means if you have a larger account and have been searching for a broker, which will allow you to place bigger trades and make more money, you can trade at 24option. And if you have a smaller account, you can still trade flexibly here without worrying about “outgrowing” your broker when your account gets much larger. There are 36 trading instruments available including currencies, commodities, indices, and stocks. You can do standard High/Low trades, or you can do One Touch or Boundary trades. 60 Second trades have recently become available as well. It is great that you can do several types of trades since 24option offers a variety of underlying assets. You will also notice that early closure is available if you want to exit a trade early and save money when it is turning against you. Have in mind that investors can lose their whole capital by trading binary options and Forex/CFDs. In addition to traditional binary options, 24option now offers trading services in CFDs (Forex and other markets) via MetaTrader 4 platform. Compared to binary options, CFD trading offers opportunity to hold the position open for an indefinite period of time and also use custom profit and loss targets in addition to flexible position sizes. There are a lot of educational resources and trading tools available at 24option, which predisposes us to think well of them. When you look under Education, you will find a free eCourse, trading eBook, interactive eBook, trading videos, and Major Market Indicators (a guide to major fundamental reports and other market movers). These training tools can help familiarize you with fundamental analysis and more; this is much better than the standard how-to and glossary pages (they have those too) that many brokers offer. It is one thing to learn how to click a mouse; it is another to learn how to trade. 24option is encouraging education, which means they are interested in long-term clients. 24option’s resources will not teach you ever that you need to learn to trade binary options successfully and profitably, but it is a great start on your education. Customer service can be reached via telephone (numbers for different countries are available), email, fax, or live chat. We were pleasantly surprised that someone was actually available to talk to us via live chat, although she was unable to answer our questions and directed us to send an email instead. While this was slightly dismaying, it was still worlds better than what we have found on other binary options websites. We are used to unstaffed help desks and emails which are ignored for weeks. So we take this as a sign that the customer service on 24option is superior to most other binary options brokers. We should point out that the help desk was not staffed for every language, but at least the website told us which desks were staffed and which ones were not, up front. Overall, we are pretty impressed with 24option. Their website is polished and well organized, they offer mobile trading and a demo account, they provide a number of educational resources, and they actually staff their help desk. Moreover, 24option is actually a regulated broker, and there are not a whole lot of those. They have a strong reputation, and if you look them up, you will find a lot of positive customer ratings and reviews on third party websites. cannot seem to get what i need . would like to get some more info. What other info would you like to get? Just a couple of comments about 24 Option. I’ve had an account with them now for almost 2 years. I can say that the minimum deposit of $250 is a myth. I’ve tried it and I always get a message saying deposit failed because the minimum is $500. One other thing that I’ve encountered with the 24 Option site is this: I would say that on at least 25% of my trade attempts using the 60 second option, I get stopped because “the price is changing”. When that message pops up, I can’t do anything until I click the “X” to clear the message, then I must reenter my trade all over again. This is indeed very frustrating when the timing on such trades is very critical. I have not encountered this on any other binary options trading site that I use.